The something old meant to carry on family traditions and lineage. Something new symbolized the future for the Bride and Groom. Something borrowed is related the transfer of happiness from a happy couple you may know. Something blue infers love as blue represents love and loyalty as well as the purity of the Bride. The Silver sixpence represents the dowry paid by the Bride’s family to the Grooms family. In today’s society perhaps having savings plan for the future for the couple would be a good idea. We have all heard this and Brides often are in a frenzy trying to find items to wear in their ceremonies to fulfill these criteria. Often the Wedding Gown qualifies for the something new, old or borrowed. A special piece of Wedding Jewelry can be old, borrowed, new or blue. Wedding Garters have blue accents on them to fill in for the blue and the new. An heirloom handkerchief can be wrapped in the bouquet for the old and blue. The combinations may seem endless. Something Old: Sew a piece of lace from your mother’s wedding gown into your new wedding gown. Carry an old photo of your parents from their wedding. Wear an heirloom piece of jewelry from your grandmother. Even classical music playing during the ceremony fits the bill. Something New: Easiest to fulfill: New Wearing new wedding gown, carrying new flowers for Bridal Party, practically anything new to the Bride works here. Something borrowed can be the most special to the bride. Who you borrow from is really important and most meaningful in this case. Borrowing a special pair of earring from your mother, a best friend or a beloved family member adds a special touch to the ceremony. A comb or hairpiece worn by the bride’s mother will bring a tear to her eye and touch her heart. Something Blue: This is where the Bride can have a bit of fun. 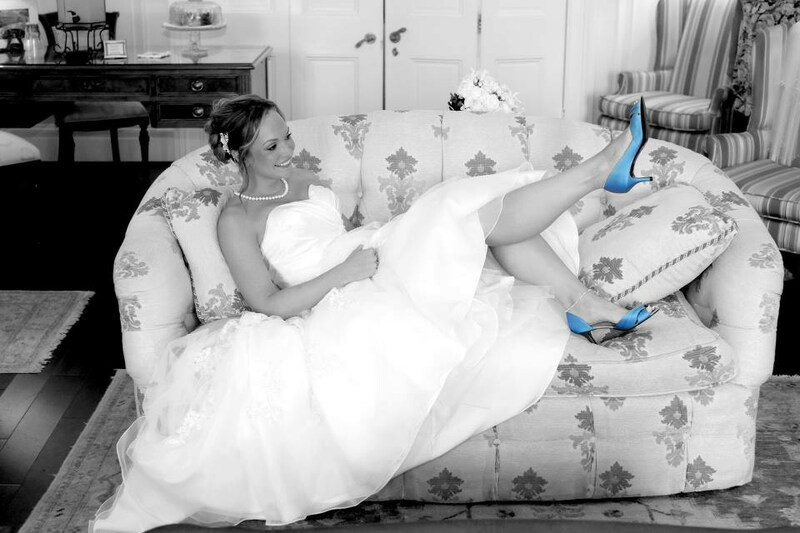 Brides are wearing Blue Shoes instead of traditional white satin shoes to add levity to the day and get in their blue. Some brides choose to get a manicure or pedicure that incorporates a touch blue on the nails. Wearing a Blue Garter is a long standing tradition; some brides are expanding that with blue underwear under the dress. Keeping it simple Brides often wrap a blue ribbon around the Bridal Bouquet. Making your Wedding Day about you is the most important tradition to remember. The Wedding Coordinators at Historic Kent Manor Inn look forward to assisting you navigate your special day. This entry was posted in annapolis, corporate meetings, eastern shore, historic_inn, kent island, luxury dining, retreats, waterfront, waterfront restaurant, weddings and tagged bay front weddings, Bride, Groom, Kent Island Weddings, Something old, stevensville, Tradition, Victorian Era, Wedding, Wedding Ceremony, Wedding dress, Wedding reception, Wedding Traditions, weddings, weddings kent island annapolis waterfront. Bookmark the permalink.